Map showing the theoretical union located in the world map. 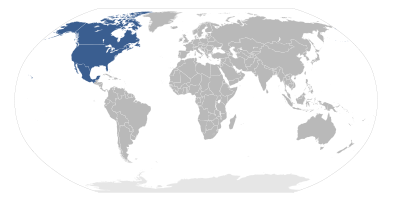 The North American Union (NAU) is a theoretical economic and political continental union of Canada, Mexico, and the United States (sometimes Greenland and Cuba are included). The concept is loosely based on the European Union, occasionally including a common currency called the Amero or the North American Dollar. A union of the North American continent, sometimes extending to Central and South America, has been the subject of academic concepts for over a century, as well as becoming a common trope in science fiction. One reason for the difficulty in realizing the concept is that individual developments in each region have failed to prioritize a larger union. Some form of union has been discussed or proposed in academic, business, and political circles for decades. However, government officials from all three nations say there are no plans to create a North American Union and that no agreement to do so has been proposed, much less signed. The formation of a North American Union has been the subject of various conspiracy theories. Since at least the mid-19th century, numerous concepts for a union among Canada, Mexico and the United States of America, some including the Caribbean, the Central American and the South American countries, have been proposed, such as the North American Technate. Following the North American Free Trade Agreement (NAFTA) and the Maastricht Treaty going into effect there was speculation about the formation of a North American Union, similar to the European Union created by Maastricht, being a possible future step for the region. Several proposals for continental integration of North America advocated the creation of a union styled after the European Union, though many academic and business groups advocated less dramatic changes involving the formation of a customs union or common market. While serving as a policy adviser to the presidential campaign of Vicente Fox during the 2000 general election in Mexico, Jorge Castañeda, influenced by academic Robert Pastor‘s ideas on deepening integration of NAFTA, encouraged Fox to include policies on integration as part of his campaign. Before and after the election Fox made appearances on several U.S. news programs advocating greater integration including a plan to open up the U.S.-Mexico border within ten years. 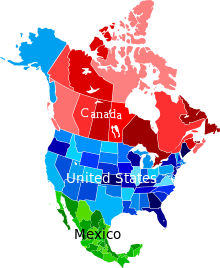 Some in the United States saw this proposal for open borders as a call for or inevitable step towards a “North American Union” and received it with a mixture of praise and criticism, with critics like Pat Buchanan suggesting it would mean an end to U.S. sovereignty. During an interview for Commanding Heights: The Battle for the World Economy in 2001, after he was elected president, Fox said that he sought with the United States a “convergence of our two economies, convergence on the basic and fundamental variables of the economy, convergence on rates of interest, convergence on income of people, convergence on salaries.” He suggested this might take as long as 20 years to be realized, but the ultimate “convergence” he saw between the United States and Mexico would allow them to “erase that border, open up that border for [the] free flow of products, merchandises, [and] capital as well as people”. Fox cited the success he claimed countries Republic of Ireland and Spain had in modernizing their economies and raising the standard of living for their citizens by joining what is now the European Union. Vicente Fox also proposed a plan to U.S. President George W. Bush and Canadian Prime Minister Jean Chrétien that he said would move the North American continent towards an economic union based on the example of the European Union. Fox’s proposal was rejected by President Bush, with Fox later alleging in his book Revolution of Hope that the White House wanted him to “stop raising hackles” by talking about a North American Union. Later, amid a push for greater integration and concerns about the impact of heightened security on trade relations following the September 11 attacks in 2001, an effort was organized in 2003 by the Canadian Council of Chief Executives, U.S. Council on Foreign Relations, and the Mexican Council on Foreign Relations called the Independent Task Force on North America. Several weeks before a meeting of North American leaders on March 23, 2005 the Task Force issued a press release and a statement from the Task Force’s chairmen calling for deeper integration of NAFTA to form a North American Economic and Security Community by 2010. Two months later at the March meeting of North American leaders, the Security and Prosperity Partnership of North America (SPP) was formed. It was described by the leaders of Canada, Mexico and the United States as a dialogue to provide greater cooperation on security and economic issues. In response to later concerns, a section was put up on the initiative’s site clarifying the SPP was not a legal agreement, that the initiative “does not seek to rewrite or renegotiate NAFTA”, and that the partnership itself “creates no NAFTA-plus legal status.” A number of academics and government officials at the time viewed the SPP as moving North America towards greater integration. In May 2005, the Task Force published a report praising the SPP initiative and pushing for greater economic integration by 2010. They repeated their call for the “establishment by 2010 of a North American economic and security community, the boundaries of which would be defined by a common external tariff and an outer security perimeter.” In the report the Task Force said that a North American Community, which would be similar to the European Community which preceded the EU, should not rely on “grand schemes of confederation or union” and did not suggest a supranational government or a common currency. The Task Force’s recommendations included developing a North American common market and security perimeter, among other common goals. The SPP initiative was officially ended in August 2009 though the North American Leaders’ Summit and most of the working groups set up under the initiative remain active. Several advocates of integration saw the SPP as being insufficient. One criticism was that the governments lacked a “vision of what North America might become” and as such did not provide the proper context that would allow the initiative to deal with barriers to deeper integration. In 2005, claims emerged from critics of North American integration that a “North American Union” was not only being planned, but was being implemented by the governments of Canada, Mexico, and the United States. These critics cited the formation of the Security and Prosperity Partnership of North America and claimed it was an attempt to dramatically alter the economic and political status quo between the countries outside of the scrutiny of the respective national legislatures, a critique heightened by the subsequent publication of the Independent Task Force on North America report which praised the SPP initiative and called for greater economic integration by 2010. While a broad spectrum of observers criticize the secrecy of the SPP and its dominance by business groups, the specific claim that its true aim was to expand NAFTA into a North American Union analogous to the European Union (EU), with open borders and a common currency among other features, was being made by the fall of 2006, when conservative commentators Phyllis Schlafly, Jerome Corsi and Howard Phillips started a website dedicated to quashing what they perceived as the coming North American “Socialist mega-state”. The belief that a North American Union was being planned and implemented in secret became widespread, so much so that the NAU was a topic of debate during the 2008 American presidential campaigns and the subject of various U.S. Congressional resolutions designed to thwart its implementation. Prominent critics such as Lou Dobbs, then an employee of CNN and Republican presidential candidate Ron Paul denounced the concept, joined by left-wing nationalist groups in Canada, Internet blogs, and widely viewed videos and films such as “Zeitgeist“. Corsi’s 2007 book The Late Great USA: The Coming Merger with Mexico and Canada also helped bring the NAU discussion into the mainstream. These beliefs are the latest example of a long line of erroneous conspiracy theories which suggest that the United States’ sovereignty is being eroded by a cabal of foreign and domestic players. Phyllis Schlafly claimed the actual goals of the SPP were confirmed by the Task Force, and by the Task Force’s co-chair American University professor Robert Pastor. Critics often cite Pastor as being the “father” of the NAU and his 2001 book “Towards a North American Community: Lessons from the Old World for the New” has been called a blueprint for the plan, and includes a suggestion to adopt a common North American currency called the amero. States, Provinces, Territories, and Districts within North America. Concepts of a North American Union share a number of common elements between them. NASCO and the SPP have both denied that there are any plans to establish a common currency, a “NAFTA Superhighway”, or a North American Union in “Myths vs Facts” pages on their websites. The “amero” is the appellation given to what would be the North American Union’s counterpart to the euro. It was first proposed in 1999 by Canadian economist Herbert G. Grubel. A senior fellow of the Fraser Institute think-tank, he published a book entitled The Case for the Amero in September 1999, the year that the euro became a virtual currency. Robert Pastor, vice-chairman of the Independent Task Force on North America, supported Grubel’s conclusions in his 2001 book Toward a North American Community, stating that: “In the long term, the amero is in the best interests of all three countries.” Another Canadian think-tank, the conservative C.D. Howe Institute, advocates the creation of a shared currency between Canada and the United States. Although then-Mexican President Vicente Fox had expressed support for the idea, when Grubel brought up the idea to American officials, they said they were not interested, citing lack of benefits for the U.S.
On August 31, 2007, Internet broadcaster and conspiracy theorists Hal Turner and Ace Sabau claimed to have arranged for a United States government minted Amero coin to be smuggled out of the U.S. Treasury Department by an employee of that organization. Snopes has assessed both Turner’s story and the existence of the amero as false. Interstate 29 and Interstate 35. The Ministry of Transportation for the province of Alberta displays a diagram on their website that labels I-29 and I-35 as “NAFTA superhighway”. In 2011, the Texas Legislature repealed its authorization for the establishment and operation of the Trans-Texas Corridor. In September 2006, U.S. Representative Virgil Goode proposed with six co-sponsors non-binding House Concurrent Resolution 487, which specifically outlined opposition to a North American Union or a NAFTA Superhighway as a threat to U.S. sovereignty. The bill never left committee. The same resolution was reintroduced by Goode in January 2007 for the 110th Congress as House Concurrent Resolution 40, this time with forty-three cosponsors, including 2008 Republican presidential candidates Duncan Hunter, Ron Paul and Tom Tancredo, who have all expressed opposition to a North American Union during their campaigns. U.S. Commerce Secretary Carlos Gutierrez stated in 2007: “There is no secret plan to create a North American union, or a common currency, or to intrude on the sovereignty of any of the partner nations”. Pastor, Robert A.; Hills, Carla A.; Jones, James R.; Manley, John P.; Niles, Thomas M.T. ; Cunningham, Nelson W.; Weld, William F.; Yzaguirre, Raul H. (May 2005). Building a North American Community (Task Force Report #53). Council on Foreign Relations Press. ISBN 978-0-87609-348-1. Retrieved 2009-02-07. ^ a b Hiltz, Robert (2 June 2011). “Leaked U.S. cable lays out North American ‘integration’ strategy”. National Post. Archived from the original on 2011-06-09. Retrieved 27 January 2012. ^ a b “cable 05OTTAWA268, PLACING A NEW NORTH AMERICAN INITIATIVE”. Wikileaks. January 28, 2005. Retrieved 27 January 2012. ^ Braun, Stephen (2007-11-30). “Paul believes in threat of North American superhighway”. Los Angeles Times. Retrieved 2010-05-20. Dine, Philip (2007-05-19). “Urban legend of “North American Union” feeds on fears”. The Seattle Times. Retrieved 2007-07-16. ^ a b Braun, Steven (2007-11-30). “Paul believes in threat of North American superhighway”. Los Angeles Times. Retrieved 2007-12-06. “Diverted by jelly-beans”. The Economist. 2007-08-23. Retrieved 2007-12-06. Kovach, Gretel (2007-12-10). “Highway to Hell?”. Newsweek. Retrieved 2007-12-07. Bennett, Drake (2007-11-25). “The amero conspiracy”. International Herald Tribune. Archived from the original on 28 February 2009. Retrieved 2007-12-20. ^ Bradshaw, York W.; Michael Wallace (1996). Global inequalities. Pine Forge Press. ISBN 978-0-8039-9060-9. ^ Kibel, Paul Stanton (1999). The Earth on Trial: Environmental Law on the International Stage. Routledge. ISBN 978-0-415-91995-1. ^ Fetzer, Joel S. (2000). Public Attitudes Toward Immigration in the United States, France, and Germany. Cambridge University Press. ISBN 978-0-521-78679-9. ^ “A New Giant Sucking Sound”. AlterNet. 2001-12-18. Retrieved 2010-04-21. ^ “Perspectives on the United States and Mexico: A Journalists’ Forum”. University of California, Berkeley. 2003-09-26. Archived from the original on 2010-06-15. Retrieved 2010-04-21. ^ Clarkson, Stephen (2008). Does North America Exist? : Governing the Continent after NAFTA and 9/11. University of Toronto Press. ISBN 978-0-8020-9653-1. ^ a b c “Commanding Heights: Vicente Fox”. PBS. 2001-04-04. Retrieved 2008-02-26. ^ “Open U.S.-Mexican Border”. The Brookings Institution. 2000-07-28. Archived from the original on 2010-06-08. Retrieved 2010-04-19. ^ “Open Nafta Borders? Why Not?”. The Wall Street Journal. 2001-07-02. Retrieved 2010-04-21. ^ “July Fourth in Post-America”. National Review. 2001-07-03. Archived from the original on 2011-07-28. Retrieved 2010-04-21. ^ “Death of the West”. MSNBC. 2003-10-30. Retrieved 2010-04-19. ^ Fox, Vicente (2007). Revolution of hope: the life, faith, and dreams of a Mexican president. Viking. p. 101. ISBN 978-0-670-01839-0. ^ “The Task Of Today’s CCCE: Moving Multilateral Trade Forward”. The Metropolitan Corporate Counsel. 2009-10-04. Retrieved 2009-12-01. ^ “Trinational Call for a North American Economic and Security Community by 2010” (Press release). Council on Foreign Relations. 2005-03-14. Archived from the original on 2009-06-27. Retrieved 2009-12-01. ^ a b “SPP Myths vs Facts”. Security and Prosperity Partnership of North America. Archived from the original on 2007-12-03. Retrieved 2007-12-07. ^ “The Current Debate Regarding the SPP: Security and the Integration of North America” (PDF). Center for North American Studies. 2009-12-24. Archived from the original (PDF) on September 24, 2009. Retrieved 2009-12-24. ^ “83799$CH2A” (PDF). Retrieved 2011-03-02. ^ “SPP and the Way Forward for North American Integration” (PDF). Lubin School of Business. March 2006. Archived from the original (PDF) on 2010-10-10. Retrieved 2010-04-24. ^ Pam Woolridge. “Behind Closed Doors: What they’re not telling us about the Security and Prosperity Partnership”. Canadians.org. Archived from the original on 2011-01-01. Retrieved 2011-03-02. ^ “Congress.gov – Library of Congress”. thomas.loc.gov. ^ “North American Union?”. CNN. 2006-06-21. Retrieved 2008-06-25. ^ “The Plan to Integrate the U.S., Mexico and Canada – July 2005 Phyllis Schlafly Report”. Eagleforum.org. Retrieved 2011-03-02. ^ “North American Union: Conspiracy or Coverup?”. Eagleforum.org. Retrieved 2011-03-02. ^ “Michael Medved Loses His Cool Over North America Union”. Human Events. Retrieved 2011-03-02. ^ “Meet Robert Pastor: Father of the North American Union”. Human Events. Retrieved 2011-03-02. ^ “North American Union leader says merger just crisis away”. Worldnetdaily.com. Retrieved 2011-03-02. 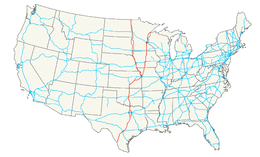 ^ “Trans America – Are an international super highway and a North American Union on the horizon?A proposed multi-modal transportation system could leave Oklahoma stuck in the middle – Cover Story – Urban Tulsa Weekly”. Urbantulsa.com. Archived from the original on 2007-06-14. Retrieved 2011-03-02. ^ a b Herbert G. Grubel (1999). “The Case for the Amero: The Economics and Politics of a North American Monetary Union” (PDF). The Fraser Institute. Archived from the original (PDF) on 2008-12-19. Retrieved 2009-02-02. ^ a b Herbert G. Grubel (1999). “The Case for the Amero: The Economics and Politics of a North American Monetary Union”. The Fraser Institute. Archived from the original on 2009-01-30. Retrieved 2009-02-02. ^ Pastor, Robert. “North America’s Second Decade”. Foreign Affairs. January/February 2004. Archived from the original on 2008-03-10. Retrieved 2008-02-26. ^ Pastor, Robert (2001). Toward a North American Community: Lessons from the Old World for the New. Washington, D.C.: Peterson Institute. p. 115. ISBN 978-0-88132-328-3. ^ “Canada Should Pursue North American Currency Union” (PDF). C. D. Howe Institute. June 22, 1999. Archived from the original (PDF) on September 28, 2007. Retrieved 2007-09-25. ^ Anderson, James E.; Van Wincoop, Eric (September 2004). “Trade Costs” (PDF). Journal of Economic Literature. 42 (3): 691–751. doi:10.1257/0022051042177649. Archived from the original (PDF) on 2009-03-04. Retrieved 2009-02-02. ^ “Amero Uproar”. Snopes.com. Retrieved 2009-06-24. ^ “Texas Legislature Online – 82(R) History for HB 1201”. Texas Legislature. Retrieved January 28, 2013. ^ “Texas Legislature Online – 82(R) Text for HB 1201” (PDF). Texas Legislature. Retrieved August 13, 2013. ^ “The Daily Show with Trevor Noah”. Comedy Central. ^ “Book World: Vicente Fox’s ‘Revolution of Hope‘“. Washington Post. 2007-11-06. Retrieved 2008-02-26. ^ “H. Con. Res. 487”. Legislation of the 109th United States Congress. GovTrack.us. 2006-09-28. Retrieved 2007-12-27. Expressing the sense of Congress that the United States should not engage in the construction of a North American Free Trade Agreement (NAFTA) Superhighway System or enter into a North American Union with Mexico and Canada. ^ “H. Con. Res. 40”. Legislation of the 110th United States Congress. GovTrack.us. 2007-12-09. Retrieved 2007-12-27. Expressing the sense of Congress that the United States should not engage in the construction of a North American Free Trade Agreement (NAFTA) Superhighway System or enter into a North American Union with Mexico and Canada. ^ “Ron Paul 2008 ” Issues ” American Independence and Sovereignty”. Ronpaul2008.com. 2011-02-25. Retrieved 2011-03-02. ^ “On the Issues”. Archived from the original on December 18, 2007. Retrieved April 24, 2008. ^ McKenna, Barrie (2007-06-11). “Security and prosperity?”. The Globe and Mail. Retrieved 2007-12-06. ^ Remarks to U.S. and Canadian Chambers of Commerce. United States Department of Commerce. 2007-10-30. Retrieved 2007-12-06. ^ President Bush Participates in Joint Press Availability with Prime Minister Harper of Canada, and President Calderón of Mexico. White House.gov. 2007-08-21. Retrieved 2007-12-06. American University’s Center for North American Studies (CNAS) educates and promotes policy debates between governments on the North American Region. Arizona State University’s North American Center for Transborder Studies (NACTS) is a center for scholars regarding the trilateral issues in North America. H. Con. Res. 40: Expressing the sense of Congress that the United States should not engage in the construction of a North American Free Trade Agreement (NAFTA) Superhighway System or enter into a North American Union with Mexico and Canada. United North America is a non-profit organization that advocates the admittance of Canadian provinces into the United States as new states of the Union, however rejects the idea of Mexico being part of the union.